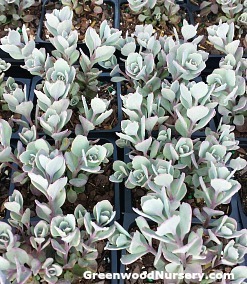 Our newest succulent plants, the Sedum Lidakense. This blue stonecrop is a strong grower for poor soil areas in full sun. This flora grows creeping ground covers while some of the plants are clumping as in the picture. Growing up to 12 inches tall, the succulent leaves will vary in size. In late summer, the thick leaves pop with hot pink blooms. The contrasting colors are unusual, interesting and beautiful. The Sedum cauticolum 'Lidakense' grows in full sun loves hot, dry soil. As with most sedums, the Lidakense is drought tolerant once established and deer resistant. Produces hot pink flower heads with upward-facing, starry-crystalline blooms that are excellent nectar producers attracting butterflies, bees and hummingbirds. Later this summer, the thick blue-green leaves explode with broccoli like hot pink blooms. The contrasting colors are most unusual, interesting and so beautiful. Intolerant of wet or damp soil. Great companion plants are Sedum Angelina, Blue Spruce Sedum, Stella D'Oro Daylily, Boulder Blue Fescue (ornamental grass) and Happy Face Potentilla. Sedum cauticolum 'Lidakense' is available in 3.5 inch pots. Orders shipping to AZ and CA addresses will be bare rooted and root washed before being prepped for shipping.